No one needs to know about my abortion; it’s my private matter! Why should I expose myself to condemnation or rejection? What good will it do? 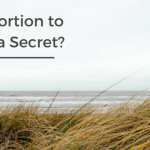 These are thoughts many women and men use to justify their keeping an abortion secret. Secret-keeping has a profound impact on our lives. The difference between privacy and secrecy is shame. Our shame stories carry enormous power. So much so, that we may not even realize how much the secret controls us. You may know someone who hides the truth about his/her abortion(s). They may not realize this hidden secret could be the source of their depression, anger, addictions, or nightmares. 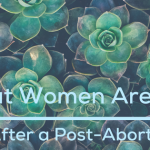 Post-traumatic stress after abortion is real. We cannot overcome and thrive on our own. Often times, we need someone to come alongside and say, “Me too.” We need to hear stories of recovery, freedom and healing, to give us hope that life can be different for us, too. Each year, more women and men say yes to healing after “choice”. They trust the promise of confidentiality and compassion when they make a call or send an email to someone who cares and who can relate in a personal way. 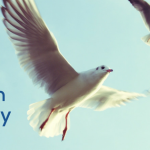 New support group 8-week studies or one-on-one support are offered through the Hearts Restored program at Clarity. Pain must come out in a healthy, safe and secure way. When sorrow is unexpressed, our hearts and emotions are broken, and we need restoration through a grieving process. Step out in faith today and begin to walk your path to restoration!